I'm a fan of email lists. Every business, nonprofit, and personal website should have a lead capture, a lead magnet, and a regularly-engaged email list. (I've written about this here.) That email list is a direct line to people interested in you, your skills, your business, your product, or your organization. It's your way to get eyes on what you think matters -- without having to compete with social media algorithms or gatekeepers of any kind. Everybody on your email list has self-selected as a high-quality reader. They've given you their information, voluntarily, because they're interested in hearing more. That's great and a powerful tool for marketing. 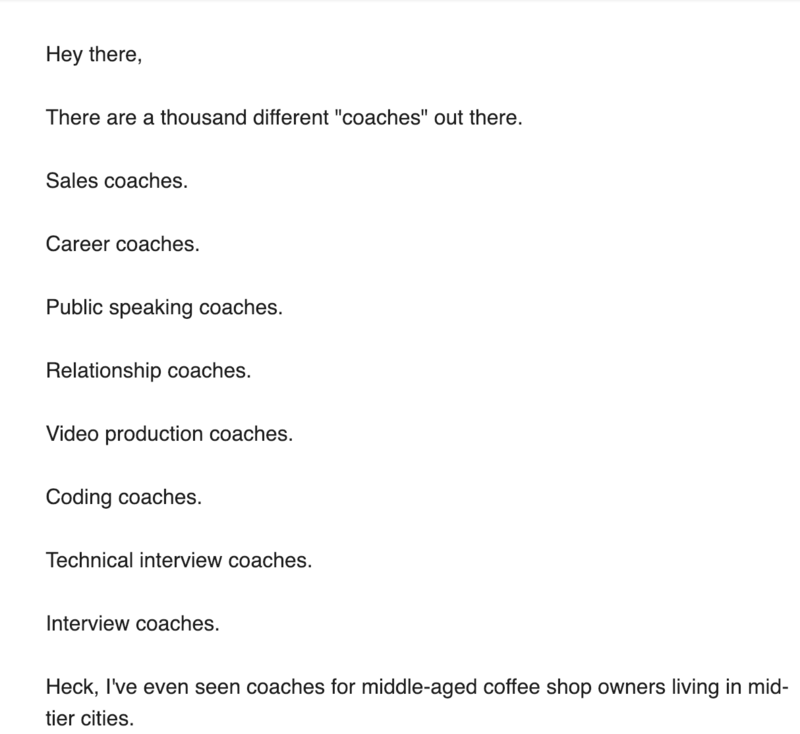 My own email list includes thousands upon thousands of people who have told me that they want to hear more about outreach, careers, and professional success when I have something to say. But your email list can do more than just market new information. And it can drive value for you even before you have new content, products, or services to offer email list readers. Cold, Corporate Newsletters -- Or Emails from a Friend? 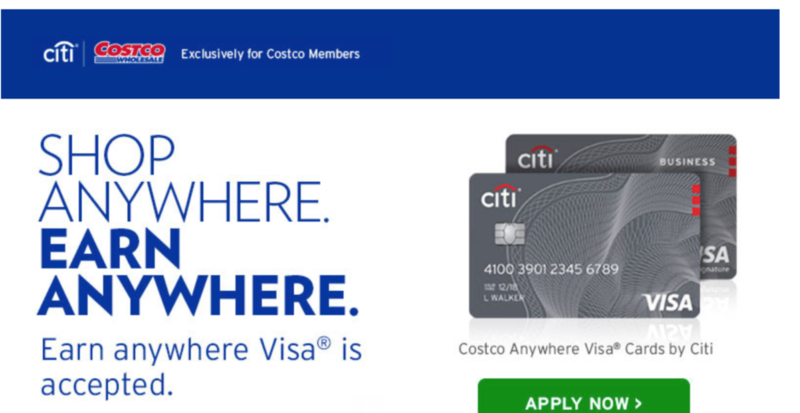 That works fine for Costco -- they're a massive corporation with thousands of employees and a global brand -- but it wouldn't work well for most medium-sized businesses and looks awkward and weird for personal brands. Nobody is building a relationship with Costco. You can't put a face to Costco. But when somebody joins your email list -- or the email list of your organization or your startup or even your medium-sized business that has a strong personality behind it -- they're joining in part because of who you are and how you make them feel. They want to hear from you. It looks like an email. I open with "Hey there," (I don't collect readers' first names right now) and then go directly into a conversational tone. It's easy to read, easy to comprehend, and -- this is important for later in this post -- easy to reply to. This isn't anything new. This is how direct mail worked in the 80s and 90s and its how a lot of entrepreneurs and business owners built their brands online. There's no reason an "email newsletter" needs to look like junk mail. 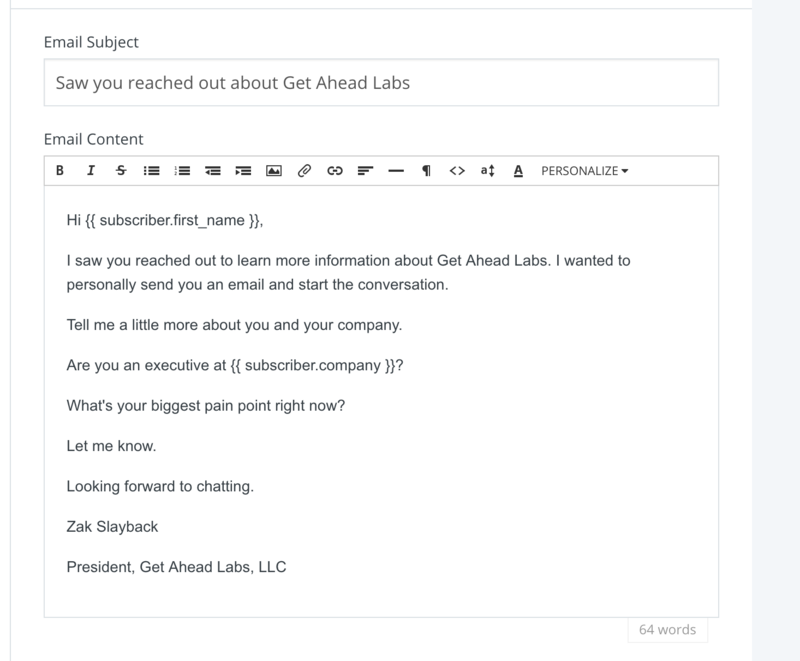 These text-based emails are designed to reflect direct mail. They're designed for people who want to read what you have to write. They're designed to build a relationship between the author and the reader. 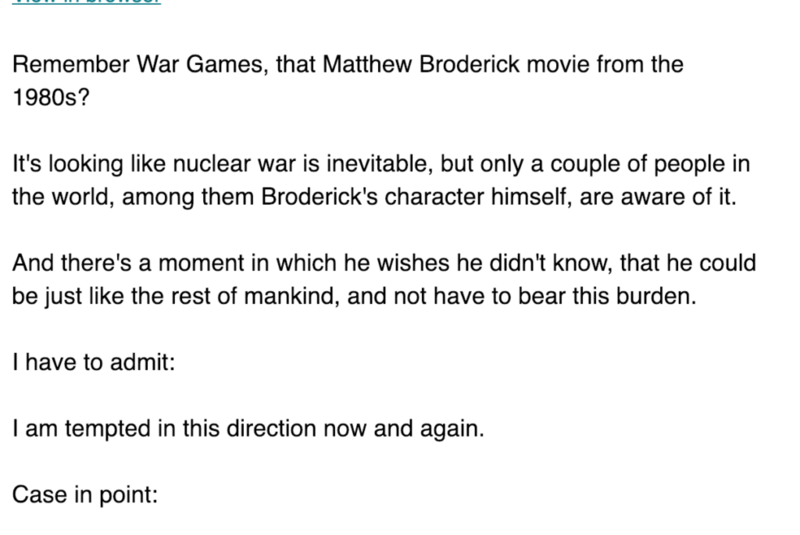 In any given newsletter, I get at least a dozen or so replies. Readers will tell me what they liked about the email, what they didn't like, and will start a conversation with me. Readers have even commented that my newsletters feel like they're an email from a friend. I love this. I write for an audience and I want to hear from them. And I want to hear what their problems and thoughts are so that I can write even better, more applicable content going forward. If you're a content creator of any kind, you should absolutely take the text-based approach to your emails. It opens up a direct line of communication with your readers that makes them feel comfortable with reaching out to you. You'll thank yourself for doing this. But you don't have to be a content creator or a have your own personal brand to do this or to benefit from it. 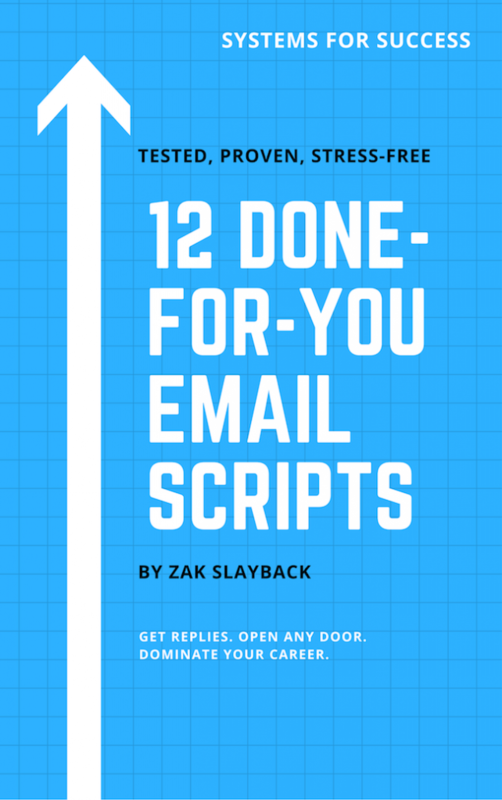 You can go a step further, though, and you don't even have to use text-based emails in most of your communications. You just have to use text-based emails for the first communication. Any time somebody joins your email list, they've explicitly opted in to receive new information from you. They're interested. This is what we'd call a hot lead in the world of sales and business development. If you were doing sales, you'd want to follow up with them immediately while they're still interested and you're still top-of-mind. Even if you aren't doing sales, you want to get in front of them -- fast. You're at the top of their mind. They're interested in hearing from you. "Okay Zak, this isn't really anything new. We know to hit them up soon. That's why most automated email funnels will send people an email within a day or so of them signing up." Yes, I know this isn't anything new. But what I'm saying here isn't "your company should hit them up immediately," or "your generic email newsletter should hit them up immediately." I'm saying YOU should hit them up immediately. You don't have to hawk MailChimp or ConvertKit or whatever other platform you use. You can automate this in a way that is both easy and sincere. This is what I call Conversational Conversions. You start a conversation with a hot lead by asking them a quick question in the first email they get from you (post opt-in email). You convert them to a new stage by holding a simple conversation with them. It provides you with information about your subscribers. This can be used for customer/reader discovery, sales, or for outreach purposes. It immediately builds a relationship between you and the reader. Assuming you are cultivating readers for the long-term, this is valuable as it helps your readers know you. 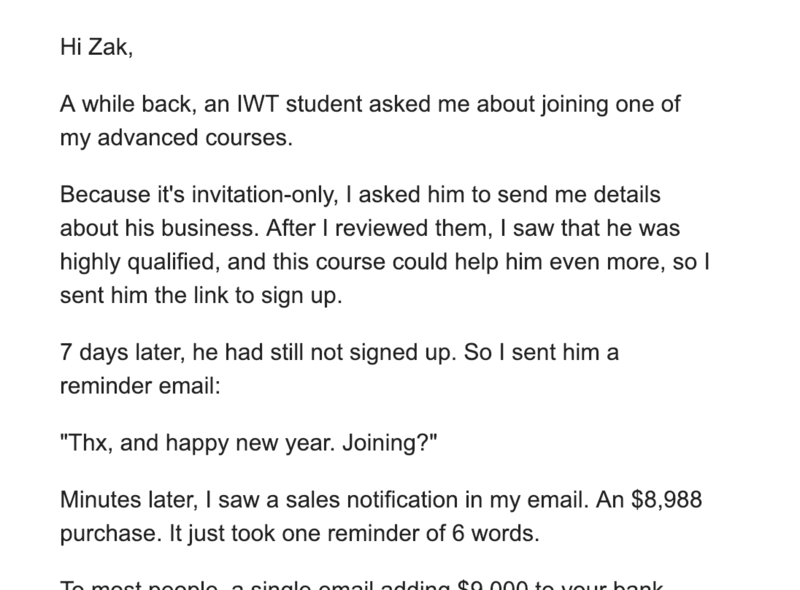 E.g., My very first student who bought Email Anybody had been on my email list for three years. When I asked him what made him buy, he said "no real reason. I just trust what you create and wanted to be in on it." That kind of trust takes a relationship with people. Note that this only works if you actually read every reply. If you're just sending an automated email that asks people a question but you don't read and reply to it (when a reply makes sense), then you're just being a jerk by leading readers on. Now, this Conversational Conversions email is pretty open-ended. That's because I'm looking for people who are really curious about my content, who I can directly help, and who may be quality readers for a long time. Maybe only 5% of my subscribers reply to this email -- but those 5% have selected themselves as people I'll pay more attention to and who I'll listen to as quality readers. It should look like it comes from a real person. You can implement Conversational Conversions for a corporate brand -- but your first email should look like it comes from a real human name, not the company name. Replies should go to a real person who reads and replies to them. The point of this system is not to deceive readers. You should actually read every reply and reply to readers when it makes sense. If you can't do this at scale, don't do it. It should ask some kind of question that's relatively easy for the target audience to answer. This just goes back to my philosophy on writing good emails in general. If your email is hard to reply to, you probably won't get a reply. Notice that I have it set to send only during reasonable hours -- 7:30 AM and 9:30 PM. I don't want people getting emails at 2 AM (unless they're in Dubai, I guess) and thinking I am awake at 2 AM (I'm not). BIG FAT WARNING: This works in an inbound funnel. People have to opt-in and already have you in their minds for this to work well. If you send emails like this without somebody opting in, you aren't starting a conversation with them, you're spamming them. Don't do that. Use the Email Anybody system for cold emailing instead. If you're a writer, editor, have a personal brand, or run a newsletter, you can use Conversational Conversions to get a better idea of what your audience wants and needs. 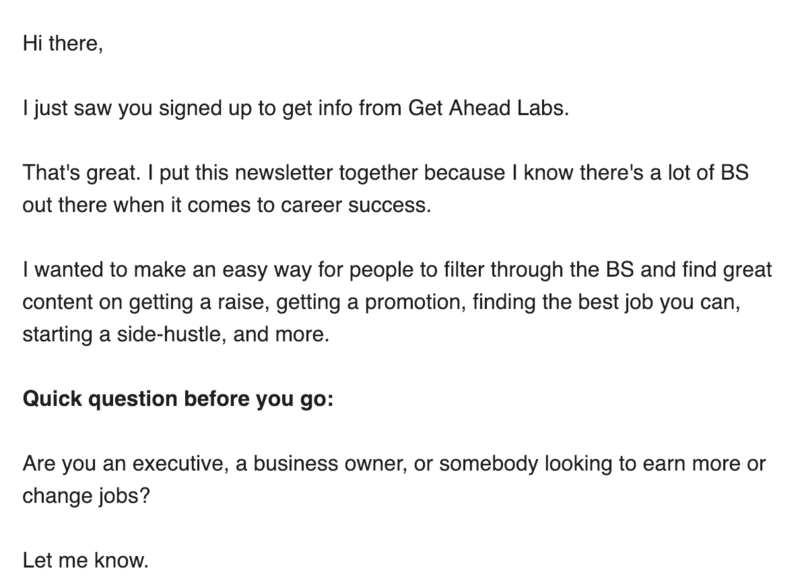 I use it for my GetAheadLabs.com newsletter. It's a weekly newsletter that curates content on career and professional development. I want to make sure I am curating content related to what most of my readers need. If most of my readers end up being entrepreneurs, for example, I don't want to keep sending them links on how to negotiate a raise with their boss. The subject line is "Just saw you signed up!" and it gets a pretty high reply rate. The conversational subject line helps. The Menu of Options reply trigger (a concept I cover in Email Anybody) makes it super easy to reply. Some people volunteer more information, but some simply reply, "looking to earn more," or "executive." There's an advanced move I could make here that I'm not (and that makes more sense for sales and outreach): I could segment the list based on people's replies. If somebody replies, "executive," I could tag them as "GAL Executive." Or if they reply, "business owner," I could tag them as "GAL Business Owner" and then curate the content of the newsletter specific to them and specific to their category. I don't do this (right now) because it just isn't worth the effort and most of my subscribers are employees, but it's another added benefit fo the Conversational Conversions system. Maybe you're not a content creator but rather a business owner or a Director of Marketing or a product manager and you want to get a better idea of what your customers want and need. You can use Conversational Conversions for that, too. 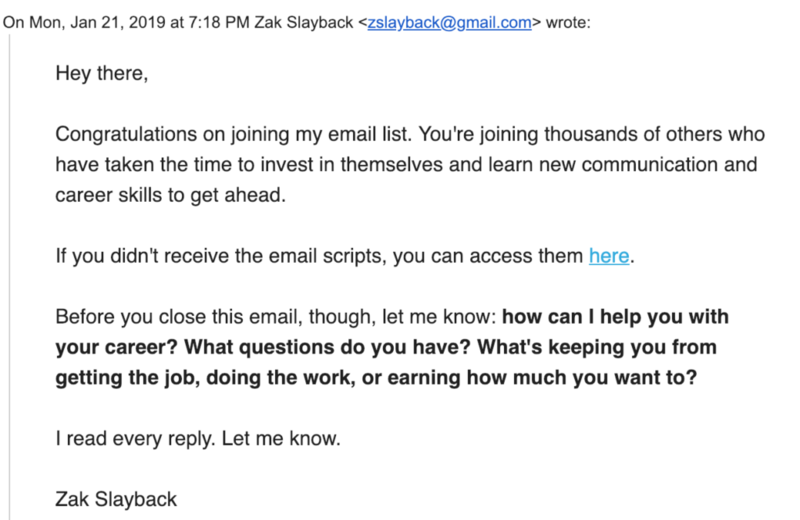 That's actually pretty close to how I use the welcome email for ZakSlayback.com. My purpose with that email is to get an idea of what people's pain points are and then use that to create new products, new services, and new content for my audience. You can do this, too, by simply asking them to choose a big pain point or to rank pain points. Then, based on their reply, you can choose to push further. You can ask them, "that's interesting, why do you think that?" or "what do you mean by [X]?" Then, based on their replies, you can choose to select them for customer discovery interviews or for more information when you do formal product development work. This is probably the most underrated use of something like Conversational Conversions. Remember that when somebody signs up for your email list or downloads your lead magnet, they're a hot lead. They're curious and willing and ready to learn more. Use that as an opportunity to get a conversation scheduled. Use that conversation to move them further down the funnel (or, use the conversational email as a way to filter them out of the funnel). This is a system that my old colleagues at a former employer did quite well and I've built upon since learning from them. I had a consulting client last year that works in electioneering. They help recruit people to work on high-potential political campaigns. But the hardest part of their process is getting quality people to actually work on those campaigns. Instead of relying on just typical recruiting tactics, we used the owners' great content creation abilities to set up a Conversational Conversions campaign. When people expressed interest in getting their guide for winning elections, they'd get an email from one of the authors asking them if they're a current student or recent graduate (their target market). If they replied that they were, the next step would be to push them to get on the phone for a quick conversation. If that conversation went well, they'd then get a follow-up email requesting that they send in more information to see if they'd be a good fit for working on a campaign. This works well. It drives engagement for people who might otherwise just be lurkers on an email list. You can use it with pretty much any kind of company or organization that involves relationship-building and complex sales. 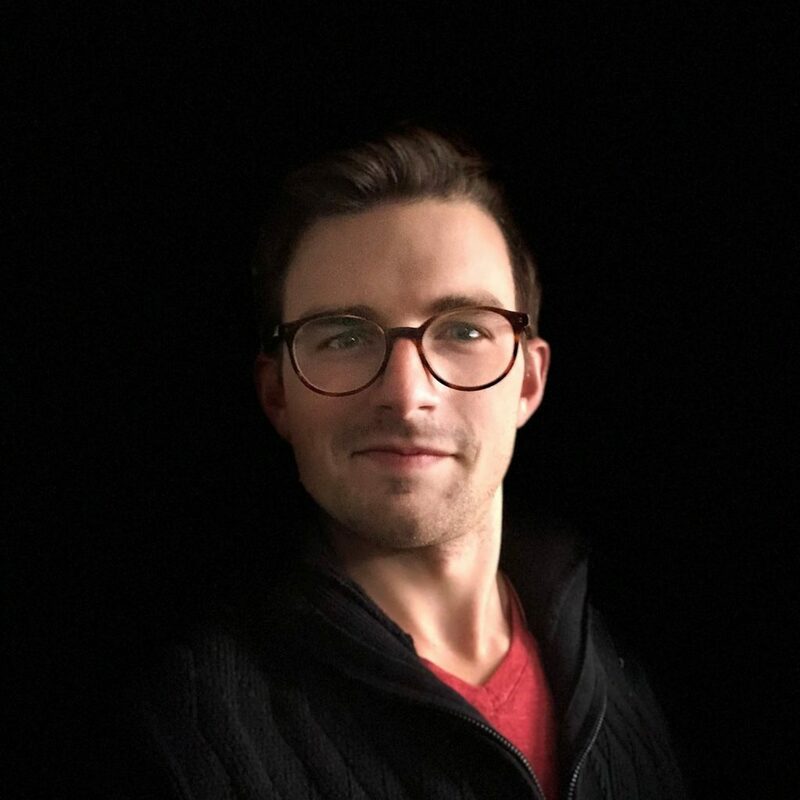 If you run a nonprofit that works with teachers, for example, you can ask a quick question of the teacher and then get on a Zoom call with them based on their reply. Or if you do software sales, you can ask a quick question to see if the subscriber is a real economic buyer. If they are, you can push them to get on a quick call with you. That's way more effective than just cold emailing people or lukewarmly emailing them after they've been on a generic email newsletter for a few months. I use something like this for the corporate side of Get Ahead Labs. We do corporate consulting on talent and outreach development. Most of our deals come through referrals, so the corporate page isn't a big part of the business, but it keeps people engaged. If people reply to that, great. I start a conversation with them and push them to get on the phone with me if they're a good fit for our services. If they don't reply to it, they get a follow up email a week later asking them if they saw the previous email. That works to get conversations rolling while simultaneously saving me from having to check my email interest form every single day. Interested candidates will reply to the first (or, sometimes, second) email. This system has treated me well. It's one that you, too, should implement in your organization (or personally on your own website) if you want to drive more engagement with and learn more about your own audience.